In the past five years or so, as a leading social media consulting agency, we have witnessed a revolution in the way businesses carry out their sales and marketing. If you do not believe this to be true, look at any business, whether small or large, and notice what marketing tactics they are using. Chances are, they are using social media to their advantage. With over 2.8 billion people using social media around the world as of 2016, it is a business mistake to neglect the power of social media marketing. Many businesses struggle with how to utilize social media to really benefit their business. The reality is, social media marketing can feel overwhelming. This is why so many businesses realize the need for social media consulting or social media management companies. To better help you evaluate your own social media marketing strategy, we created this guide on understanding social media marketing to provide you with some of the best tips to implement and use social media to market your business. We are going to share some great marketing tactics and tips with you in this article. Let’s first let’s cover the basics of what social media marketing is so there is no confusion. At its core, social media marketing is a set of strategies to market your products and services through social media accounts that you set up for your business. 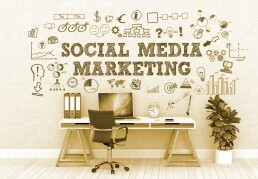 Today, social media marketing is a core part of business growth and vitality. Mastering social media marketing can result in transformational business growth! So there is a huge profit upside for a business to do it well. One of the best parts about social media marketing is how much a campaign can increase one’s brand awareness. Through simply utilizing a social media platform to promote high-valued content, your target audience will begin to recognize your brand, increasing the overall visibility of the company. As with any other marketing technique, social media marketing can significantly help improve website traffic, or physical-based traffic, and, in turn, generate more profits. The best part is that the more social media marketing, the more traffic your company can expect. What many small businesses may not know is that social media is great for increasing organic traffic by improving SEO. This is incredibly important in the bigger picture of creating an internet presence. Marketing can be very expensive for business, especially for start ups. Media such as print and broadcast, which are traditionally associated with reaching large numbers of consumers, can be expensive and out of reach for many marketing budgets. The benefit of social media marketing is that it is affordable and cost effective, particularly as a company develops discipline around the practice. In addition, with the injection of some creativity into the mix, the dividends start to pile up! Social Media Marketing gives your business a chance to engage and build a reputation with customers and your community. In doing so, your company could become an influence or inspiration, depending upon your community management strategy. There are endless benefits for small businesses that decide to invoke the power of social media marketing! So what are your next steps in leveraging the power of Social Media to build your business? To receive benefits, it’s imperative to make sure you fully understand HOW to market on social media. Otherwise, it can be a total and complete waste of money and time. Therefore, we tend to encourage small businesses to consider hiring a social media marketer or social media manager. Our first social media marketing tip for small businesses is to stop wondering when to join social media. Start today! Regardless of your niche or target audience, you must consider that customers will research a company before purchasing any of their products. What do you think a customer would assume about your company if its lacking social media accounts or presence? An online presence is crucial to the success of your company and every minute wasted is a lost opportunity. Commit to a regular presence on social media and organize resources around the task. This may be a good time to bring in expertise to help get the initiative off on the right foot. Before you can notice any significant results with social media marketing, it’s critical to take the time to study your target audiences. Social media marketing is like having a one-on-one conversation with your customer. To do that, you must have a greater understanding of your audience’s likes, dislikes, purchase preferences, age, gender, education level, employment type, relationship status, and even hobbies! Once you understand exactly who your target audience is, as if you can clearly see the image of an audience member in your mind, you can then begin to effectively ‘speak’ to them, their needs, on different social media platforms. When you see engagement starting to happen, then you know you’re on the right track in your communications. If you are currently on social media, like Facebook or Twitter, and posting information that is either boring, irrelevant, or seems like some automated machine posted it – it’s time for an important social media marketing tip: humans like communicating and interaction! Take the time to act like a human being and treat your customers like human beings. Through investing the quality time in your audience, you can guarantee that your successful efforts will be reciprocated in new customers and repeat business. Before jumping straight into social media marketing, you need to assess your branding. This entails your logo, profile picture, copy writing (biography, about page, description, etc. ), background images, and any recent posts. Your brand and image are the first thing that potential customers are going to see and, if it’s lacking in some way, is dated, or seems low-in-quality, you can guarantee the customers will question the legitimacy of your company. Ask yourself, how many times have you seen a company with poor graphics and branding and, as a result, you quickly forgot about the brand name as you moved onto a more professionally-branded company? Your branding should speak directly to your target audience and represent your company fully. If we were to look on your social media profiles right now, what would we find? Are you posting valuable material or products that you are selling? Chances are, if you are only promoting products, your efforts are counterproductive. The reality is, you are not putting your customer or their needs first, but rather focusing too much on sales. This comes across as pushy and is a turn-off. When it comes to social media marketing, the conversations you are having with your target audiences must deliver value, demonstrate your competence, establish trust, and help them understand how your products and services solve genuine issues that they face. Keep in mind, when an audience member feels as if they read a valued piece of content, they are more likely to share it with their friends, who are then indirectly marketing your content. Social media is a powerful tool in amplifying word-of-mouth benefits. One of the biggest mistakes that small businesses make when attempting social media marketing is picking the wrong platform. This can be utterly frustrating, both in terms of the money and time spent. When it comes to social media, each popular platform is designed for a SPECIFIC type of person. In other words, like your business has a target audience, each social media platform does as well. For example, a photography company would excel in social media marketing on Instagram, however, they may not find as much success on Twitter or LinkedIn. So, when it comes to your small business, take the time to think about where your customers are, what social media platform are they using. From there, focus all your social media marketing attention on that platform! If there is one tip that holds precedence, analytics is one of them. Depending upon the social media platform that you are using, each one provides companies with a wealth of information in their analytics dashboard. Take the time to study the analytics of your social media marketing campaigns, post results, and followers – and your understanding of your follower and customer base will blossom. A good understanding of your analytics can enable you to avoid a costly mistake in your marketing strategies. Now, we do understand that analytics is not always the easiest for everyone. However, you can come a long way on your own before you take the step of hiring an agency. Signing up for our weekly newsletter is a great way to climb the digital marketing learning curve for free! Become a better online marketer by clicking here and getting weekly content! If you are new to social media marketing and hoping for instant success, be patient with yourself. It takes time to gain proficiency in a new skill set. Social Media Marketing is not a tool that should be rushed; however, it should be taken in steps to avoid any potential mistakes and to maximize results. For example, when it comes to Facebook Marketing and Advertising, it’s highly advisable that small businesses start with a smaller budget ad-set to test their target audience over a course of 2-5 days. As each day passes, it’s imperative that you study the metrics and numbers and understand how your audience is reacting to your ad. Moreover, after the 5th day has passed, a company can either alter the audience or scale the budget of the ad-set by a few dollars. This is a process that can be on-going for months upon months. In fact, some of the most successful ads could last an entire year! Without patience, none of this could be possible. Another top social media marketing tip for any small business, is creating an over-riding strategy. One which guides all of the digital marketing elements including social media marketing – the plan and the schedule. The plan refers to the content that will be posted. The schedule refers to the social media posting calendar. Businesses get lost in the dramatics of social media marketing but forget about posting valuable content every day. So, whether you are planning on doing paid advertising or not, take the time to create a posting-plan. Be sure to create one that you can use over the course of the week or month. This is a great way to build a routine in which you can expand upon the future, monetize or advertise. Social media marketing can be quite hectic for small businesses who may not have the time to invest in learning or building a social media presence, both of which are essential to a successful marketing campaign. One of the best tips that we can suggest to small businesses is to hire a social media marketer or social media marketing agency to get the framework and process started. This consultant, or social media marketing agency, can help your staff get up the learning curve more quickly, eliminate learning errors, and get results happening faster for your business. The Next Best Business Development Technique – Social Media Marketing! Marketing and advertising has completely changed with the growth of the social media industry. Any business who is in growth mode is doing it with a strong injection of top notch social media marketing! With billions of consumers active on various social media platforms, businesses have a direct line of communication to their consumers! Brand new marketing communications opportunities have been borne, which build awareness, reputation, and profits! However, without proper knowledge of how to use social media or perform social media marketing, it can prove counterproductive. While the digital age is roaring, it’s essential to take the time to either learn how the industry works or hire someone to do it for you. Get out of the dark and get ahead of the competition today with Asset Digital Communications, Toronto’s Social Media Marketing Agency, on your side!